VILLA ACQUAMARINA is a charming villa for up to 6 people, at just a short walk from the beach. 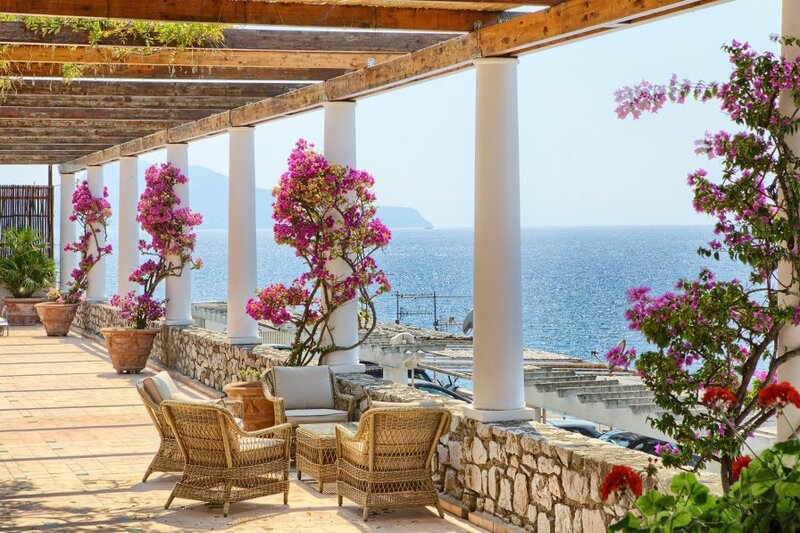 From Villa Acquamarina, you will enjoy an amazing view of the sea, the Gulf of Naples and the island of Capri. The villa is around 150 square meters in size, with a private swimming pool, direct access to the sea, a panoramic private terrace with sea view, air conditioning, parking and Wi-Fi. You will be about 1 km from the centre of Massa Lubrense, where you will find shops and restaurants. There is a Sitabus bus stop 550 m from the villa, and the closest beach (Marina della Lobra) is just 20 m away. Access to Villa Acquamarina is up 20 steps from the parking area. For a comfortable stay at Villa Acquamarina, we recommend you have a car available. You will be able to park in the villa’s private parking area, which is large enough for 2 vehicles. The villa is surrounded by a beautiful garden and large terraces. They’re equipped with chairs, sun loungers, tables, parasols and a charcoal barbecue. From here, you can enjoy a spectacular view of the sea. THE PRIVATE SWIMMING POOL, available from march 10th until October 31, is 5x6 meters in size and 1.30 meters deep. The pool area is equipped with chairs and sunbeds. From here, you can also enjoy a stunning view of the sea. THE LIVING ROOM is large and bright. Here you will find sofas, armchairs, tables, a television, a fireplace and a lunch table for six people. The room is fitted with air conditioning, heating and Wi-Fi. From here, there is access to the terrace and garden with sea view. THE KITCHEN is fitted with five gas hobs, an electric oven, toaster, fridge-freezer, coffee machine, dishwasher, washing machine, a microwave, a kettle and other appliances. Here you will also find a breakfast table for six people. From the terrace you will have access to the terrace. The kitchen is accessed from the hallway. THE FIRST BEDROOM, WITH EN-SUITE BATHROOM, has a double bed, air conditioning and heating, and is accessed from the corridor. The bathroom is fitted with a sink, toilet, shower, bidet and a hairdryer. You will reach the bedroom from the hallway. THE SECOND BEDROOM has two single beds, air conditioning and heating. You will reach the bedroom from the hallway. THE THIRD BEDROOM has a double bed, air conditioning and heating. You will reach the bedroom from the hallway. THE SECOND BATHROOM is fitted with a sink, toilet, bidet and shower. You will reach the bathroom from the hallway. Tourist tax 2,00 Euros per day per person for the first 5 nights from April to October 31. The children under 18 years do not pay. For arrivals after 8:00 PM will be applied an extra cost of 60,00 Euros to be paid at the arrival. Heating not included. Will be charged 30,00 Euros per day of use to be paid on site in cash. Air conditioning not included. Will be charged in base of consumption to be paid on site in cash. Daily cleaning not included, 3 hours a day, 3 days a week: 150,00 Euros to be paid in cash on site. The beach is a rocky beach. The street that the villa is on is very narrow and is therefore not recommended for very large vehicles. For larger groups, the villa can be booked along with Villa Ortensia, which is next door, for a combined total of 18 guests.